We service CT, MA, RI, NH, ME and parts of NY with our fleet of refrigerated trucks and professional drivers. Our trucks leave daily, Monday through Friday, to all these destinations, but it's best to contact a representative directly to get the most update schedule and delivery times. There's a minimal delivery charge which varies depending upon the exact location for delivery. Weekend delivery is available during certain holidays. For customers outside of our delivery routes, we us FedEx Ground as an alternative carrier. FedEx picks up daily, and cost is determined by the products you purchase. Delivery is usually 1-2 days, depending on location (see map below). 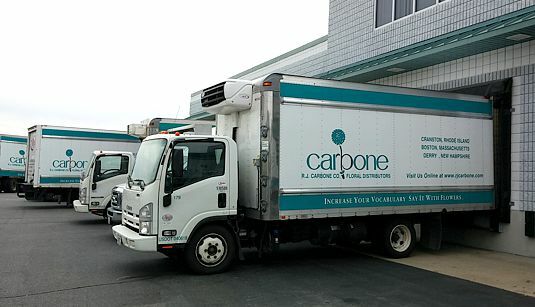 If a Carbone truck delivery is available for your area, we'll ship your order on one of our trucks, and refund back the difference in cost. Whenever possible, RJ Carbone will always try to save you money. Our preferred carrier is FedEx Ground, and cost is determined when you check out, and have selected the items for your order, and have entered the ship to address. You also have the option to provide your own FedEx account number, and have the shipping cost applied directly to you via FedEx. Certain items such as glass, ceramics as well as other large and fragile items may require additional shipping fees and are marked as "EXTRA SHIPPING CHARGES MAY APPLY". In this case, we'll get the exact shipping charge from FedEx, and email it to you for final approval. At this point you can decide to proceed with the order, or cancel. Also, if the amount and type of items, placed in your order, exceeds the size of a standard shipping box, it will be deemed "OVERSIZED" by FedEx and additional shipping charges may be applied. As is the case of fragile items, we'll get the exact shipping charge from FedEx, and email it to you for final approval. At this point you can decide to proceed with the order, or cancel. Please note we ship all items out of Rhode Island.